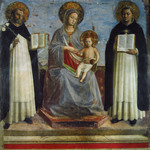 Madonna and Child with St. Dominic and St. Thomas Aquinas by Fra Angelico (c. 1395-1455). Completed around 1445, the fresco painting is held by the Hermitage, St. Petersburg, Russia. 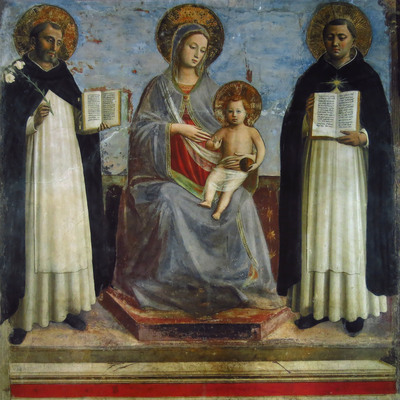 Here St. Dominic is holding a lily representing his notable chastity. Oftentimes St. Dominic is shown with a dog at his feet representing the Golden Legend. In the Golden Legend, St. Dominic's mother while pregnant dreams that she will give birth to a dog holding a torch in its mouth and "burn the world." It has been suggested that the dog represents a pun on Dominicanus, the word for a Dominican friar, and Domini canis, "dog of the Lord."